The Mediterranean is threatened by its worst ever environmental disaster after Israel's bombing of a power plant in Lebanon sent thousands of tonnes of fuel gushing into the sea, the environment minister charged. "Up until now 10,000-15,000 tonnes of heavy fuel oil have spilled out into the sea," after Israel's bombing of the power station in Jiyeh two weeks ago, Lebanese Environment Minister Yacub Sarraf told AFP Saturday. "It's without doubt the biggest environmental catastrophe that the Mediterranean has known and it risks having terrible consequences not only for our country but for all the countries of the eastern Mediterranean." Israeli forces bombed the tanks at the power station on July 14 and July 15, just days into their offensive on Lebanon which has seen blistering air strikes across the country and a bloody ground incursion in the south. The leak from one of the tanks, which are located just 25 metres (80 feet) from the sea, has now stopped but another containing 25,000 tonnes of fuel oil is still on fire and is in danger of exploding. Between 8,000-10,000 tonnes of fuel are on the shore and 5,000 on the open water. "Until now, the worst ecological disasters have taken place in the oceans and it's the first time that an oil spill has happened outside the open sea," said Sarraf. "We can have no illusions." Sarraf said that the cost of cleaning up Lebanon's once golden beaches -- which until the bombardment were major attractions for locals and tourists -- will cost between 45-50 million dollars and would not be finished until next summer. The spill is now affecting 70 kilometres (40 miles) of Lebanon's 220-kilometre-long (140 miles) coast, a third of its coastline. Beaches and rocks are covered in a black sludge which has reached the famous tourist town of Byblos, north of Beirut. "If nothing is done, not only will currents flowing towards the north mean that one third of Lebanon's coastline be hit, but also Cyprus, Syria, Turkey, Greece and even Israel," Sarraf said. "The fauna and the Mediterranean ecosystem risk suffering badly and certain species are threatened with extinction," he warned. Sarraf said that owing to the Israeli blockade of Lebanon's waters, it was impossible to send ships to clear up the pollution. "I have appealed to Britain, Italy, Spain, the United States, all the countries which have already suffered oil slicks to ask for technical assistance as we cannot act on our own," he said. Kuwait has sent 40 tonnes of material that would allow the petrol to thicken and also special carpets which absorb petroleum products. Fuad Hamdan, director of Friends of the Earth, Europe, and founder of Greenpeace Lebanon, agreed that "it is certainly the worst environmental disaster ever on the eastern Mediterranean coast." Hamdan said the eastern Mediterranean coast from the Israeli port of Haifa until Syria's Lattakiya was already heavily polluted from Israeli industry, Lebanese sewage and industry from east Beirut and from Syria. He advised people against eating fish from coastal areas. "Anyway it will smell bad and put people off." 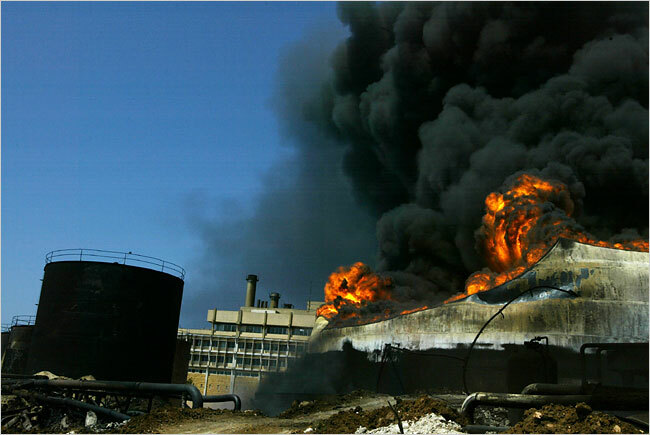 Besides the oil slick, the fire from the oil tanks has caused atmospheric pollution which has already reached Beirut. "Now the toxic cloud is stretching over a 30 kilometre distance," said Sarraf. "There's nowhere to run," Mr. Saeed said, showing off the black speckles on his skin that have turned everything white here into gray. "It's dripping fuel from the sky." "The escalating Israeli attacks on Lebanon did not only kill its civilians and destroy its infrastructure, but they are also annihilating its environment," warned Green Line, a Lebanese environmental group, in a statement issued Thursday. "This is one of the worst environmental crises in Lebanese history." Four of the plant's six oil storage containers have burned completely, spilling at least 10,000 tons of thick fuel oil into the sea initially, and possibly up to 15,000 more in the weeks since. A fifth tank burst into flames on Thursday, residents said, adding to a smoke cloud that has spewed soot and debris miles away. The fire is so hot that it has melted rail cars into blobs and turned the sand below into glass. "You can’t swim in the water anymore, it's all black," Mr. Saeed said. "This is like the Exxon Valdez spill in America," he said, speaking of the environmental damage caused when a tanker ran aground and spilled about 40,000 tons of oil into Prince William Sound in Alaska in 1989. Lebanon's coast is an important nesting ground for the green sea turtle, an endangered species, as well as a spawning ground for some Mediterranean fish. Turtle eggs begin hatching in July, but with the oil slick coating most of the area, baby turtles will have a far smaller chance of making it to deeper waters and surviving, environmentalists say. The oil slick is also threatening bluefin tuna that migrate to the eastern Mediterranean this time of year. "In Israel there are planes taking care of forest fires, but in Lebanon these fires are not being extinguished or even noticed because our priorities have shifted from the environment to relief and humanitarian work," said Mounir Abou Ghanem, director general of the Association for Forest Development and Conservation in Beirut. "In the end, who cares if a forest is on fire when there are people dying, others are being displaced and their houses or factories are on fire?" he said. "This war will affect the soil and the air," said Hala Ashour, the director of Green Line, the environmental group. "But it’s still too early to assess the actual damage because we have to analyze samples and that can’t be done before the war is over." Maher Ali, 24, a fisherman, said: "When the winds blow north, it's bearable, but when it blows east, it's deadly. The soot lands on the food and furniture and makes everything dirty. You just can’t leave a glass of water sitting around. It’s no wonder most families have given up and left."